Get the Value of your St. Charles home here. 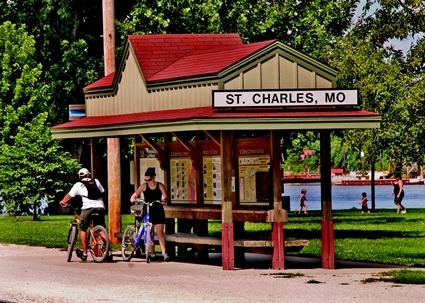 Since 1769, St. Charles, Missouri, a restored historic city on the Missouri River, has been welcoming visitors to its shores. Founded by French Canadian fur trader Louis Blanchette, the city was named Les Petites Cotes, (“The Little Hills”), which later evolved into Saint Charles. The town regularly welcomed guests from many nations and grew into an important trading center for countless pioneers. Because of its strategic location on the Missouri River and its entrance to the western territory known as the Louisiana Purchase, it was a critical destination for tens of thousands of travelers. It was in Saint Charles in 1804 that William Clark and Meriwether Lewis departed up the Missouri River seeking the route to the Pacific Ocean by order of president Thomas Jefferson. Jefferson had recently bought the Louisiana Purchase from the French and was eager to send these brave adventurers on their journey. Lewis and Clark’s presence in the region will forever be linked with Saint Charles. Saint Charles was also Missouri’s first state capital from 1821 to 1826 and the home of pioneer and explorer Daniel Boone and his family. It was Boone who created Boone’s Lick Trail through the Saint Charles countryside, out of which grew the Santa Fe Trail and later the Oregon Trail – critical paths for early pioneers seeking a better life in the western United States. Today, over 65,000 people call St. Charles their home. The City of St. Charles is headquarters for Aspect, Our365, RX System, NewCo Enterprises, Patriot Machine, and Client Services and home to the regional offices of Coca Cola Enterprises, Sysco, and American Freightways.St. Charles is the oldest city on the Missouri River. St. Charles’ sister city is Ludwigsburg, Germany.